The tools shown here are tools to be used together with a fully functioning anti-virus software and are not meant to replace it. They provide an additional source of security and work by scanning your system for malicious software and other potentially harmful stuff. 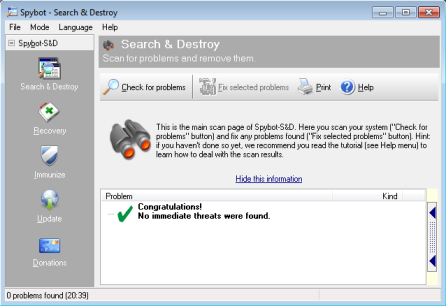 The three tools I tested were Malwarebytes' Anti-Malware, SUPERAntiSpyware Free Edition (+ Portable Edition) and Spybot Search & Destroy (+ Portable Edition). They all ran on the same system with the same prerequisites. Although, or rather because all their results in scanning differ, it is recommendable to have all of them installed and let them scan your system from time to time. Of the three softwares tested, this is the only one that found two trojans on the system. It offers a quick scan and a complete scan option where the quick scan took about 3 minutes and a complete scan took about 45 on 25 GB of data. It removed all found items accurately but unfortunately has no official portable version. Of the two trojans that were found by Malwarebytes' Anti-Malware, SUPERAntiSpyware found one but it also found quite a few adware-tracking cookies which you also might want to get rid of, although they usually are no dangerous objects. Like Malwarebytes, it offers a quick and a complete scan option, which, too, take about 3 and 45 minutes on 25 GB data. Additionally, SUPERAntiSpyware comes with many useful tools that might come handy if you have got a virus disabling critical system functions as re-enabling your task-manager or the system restore service and many more. There is also a portable version of the software that works perfectly alright and comes with the same functions as the installable free version. In the current test, unfortunately Spybot found none of the items that the others did, although it has proven worthy in previous ones. Spybot offers one scan option which takes about 20 minutes on 25 GB data. It comes with an extra feature called Immunize, which blocks certain malicious websites if activated. Furthermore, Spybot gives you the option to install TeaTimer, a process running in the background that detects malware that tries to make changes in your registry. Like SUPERAntiSpyware, Spybot offers a portable version which works well from any USB device. Malware bytes is a must have.